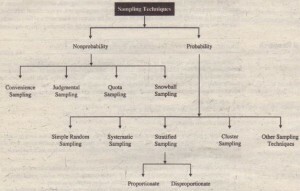 Sampling techniques may be broadly classified as non-probability and probability Non-probability sampling relies on the personal judgment of the researcher rather than chance to select sample elements, The researcher can arbitrarily or consciously decide what elements to include in the sample, Non-probability samples may yield good estimates of the population characteristics, However, they do not allow for objective evaluation of the precision of the sample results. Because there is no way of determining the probability of selecting any particular element for inclusion in the sample, the estimates obtained-are not statistically project-able to the population. 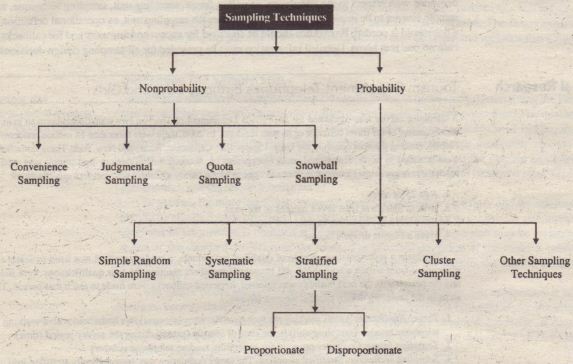 All possible combinations of these five aspects result in 32 different probability sampling techniques, Of these techniques, we consider simple random sampling, systematic sampling, stratified sampling, and cluster sampling in depth and briefly touch on some others, First, however, we discuss non probability sampling techniques. 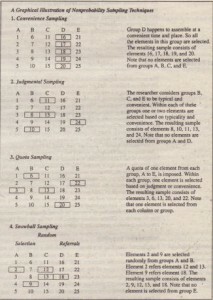 Presents a graphical illustration of the various non probability sampling techniques, The population consists of 25 elements and we have to select a sample of size 5.A, B, C, D, and E represent groups and can also be viewed as strata or clusters. Convenience sampling attempts to obtain a sample of convenient elements, The selection of sampling units is left primarily to the interviewer, Often, respondents are selected because they happen to be in the right place at the right time. Examples of convenience sampling include (1) use of students, church groups, and members of social organizations, (2) mall-intercept interviews without qualifying the respondents, (3) department stores using charge account lists, (4) tear-out questionnaires included in a magazine, and (5) “people on the street” interviews, Convenience sampling is the least expensive and least time-consuming of all sampling techniques, The sampling units are accessible, easy to measure, and cooperative, In spite of these advantages, this form of sampling has serious limitations, Many potential sources of selection bias are present, including respondent self-selection. Convenience samples are not representative of any definable population, Hence, it is not theoretically meaningful to generalize to any population from a convenience sample, and convenience samples are not appropriate for marketing research projects involving population inferences. Convenience samples are not recommended for descriptive or causal research, but they can be used in exploratory research for generating ideas, insights; or hypotheses. 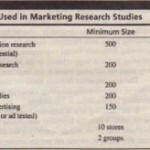 Convenience samples can be used for focus groups, pretesting questionnaires, or pilot studies. Even in these cases, caution should be exercised in interpreting the results. Nevertheless, this technique is sometimes used even in large surveys. The International Olympic Committee used surveys at the 2000 Summer Olympics in Sydney to find out what visitors thought about the level of commercialism in Sydney, One survey was given to a convenience sample of 200 visitors, asking them about what level of commercialism they find appropriate, whether they thought the event was too commercial, and whether company sponsorship of the Games was perceived to be positive. The survey, conducted by Performance Research revealed that 77 percent of the visitors found the presence of large corporations such as Coca-Cola and McDonald’s to be appropriate. Furthermore, 88 percent of the visitors thought the sponsors contributed to the Olympics positively, About 33 percent said that they thought that a company’s involvement in Sydney made them feel more positive about that company in general, Performance Research continued their study of Olympic sponsorship by conducting 900 telephone, 1,500 Internet, and 300 on-site surveys using convenience samples in conjunction with the 2002 Winter Olympics in Salt Lake City, Utah. The results with respect to companies’ sponsorship and involvement in the Olympics were again positive, The IOC used this information to enhance sponsorship revenues, For the 2002 Games, 30-second advertising spots were priced at roughly companies that advertised were Coca-Cola, Visa, Kodak, McDonald’s. Panasonic, Sports Illustrated. and Xerox. A survey was also conducted at the 2004 Olympics in Athens to assess spectators’ satisfaction with the Games, A convenience sample of 1,024 persons-46 percent Greeks. 13 percent Americans. and the rest different was used and the results indicated an overwhelming seal of approval for the Olympic Games in Athens. Surveys based on convenience samples were conducted for the 2008 Olympics in Beijing, as well. According to a survey by Survey Sampling International more than 80 percent of Chinese citizens agreed that having the 2008 Olympic Games held in their country strengthened people’s participation in sports activities. 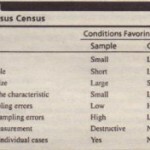 Judgmental sampling is a form of convenience sampling in which the population elements are selected based on the judgment of the researcher, The researcher exercising judgment or expertise, chooses the elements to be included in the sample, because he or she believes that they are representative of the population of interest or are otherwise appropriate, Common examples of judgmental sampling include (1) test markets selected to determine the potential of a new product, (2) purchase engineers selected in industrial marketing research because they are considered to be representative of the company, (3) bellwether precincts selected in voting behavior research, (4) expert witnesses used in court, and (5) department stores selected to test a new merchandising display system. In the department store study, 20 census tracts in the metropolitan area were selected based on judgment, Tracts with very poor people and those with undesirable (high-crime-rate) areas were excluded, In each tract, blocks judged to be representative or typical were selected. Finally, households located 10 houses apart from each other were selected within each block. The interviewer instructions were as follows. Answer the following as they pertain to the Sears project. 1. What is the target population? 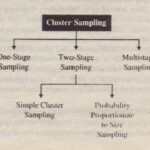 The sampling frame? The sample size? 2. Do you think the use of judgment sampling was appropriate? If not, which sampling technique do you recommend? 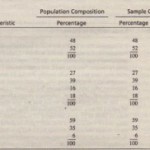 Judgmental sampling is low cost, convenient, and quick, yet it does not allow direct generalizations to a specific population, usually because the population is not defined explicitly, Judgmental sampling is subjective and its value depends entirely on the researcher’s judgment, expertise, and creativity, It may be useful if broad population inferences are not required, As in the department store example, judgment samples are frequently used in commercial marketing research projects, An extension of this technique involves the use of quotas.